Managers and supervisors are a lynchpin in the success of a change initiative. In times of change, those who lead the teams impacted by change can be both a great ally and a real obstacle for change leaders. Managers are closest to the employees who must adopt the new processes and behaviors associated with a project or initiative. And in many cases the same project also impacts their own work. Getting managers and supervisors on board and prepared to support their teams through change is crucial. In Best Practices in Change Management - 2018 Edition, participants identified engagement with and support from middle management as a top contributor to change management success. In a separate study with 575 change leaders, 84% of participants ranked manager and supervisor involvement in change initiatives as “extremely important” or “very important” to the success of their project. Managers and supervisors are crucial because of the relationship they have with the employees in the organization. They are positioned to coach and influence employees through their own change process. But what does this group really need to be doing to drive successful change? In addition to continuing their daily operational duties, Best Practices in Change Management - 2018 Edition identifies five key roles managers and supervisors need to play in times of change. Why should I get on board? The change management team needs to provide talking points and pertinent information, but those messages should ultimately be delivered to employees by their supervisor. Employees look to their supervisors not only for direct communication messages about a change, but also to evaluate their level of support for the change effort. If a manager only passively supports or even resists a change, then you can expect the same from that person's direct reports. Managers and supervisors need to demonstrate their support in active and observable ways. The key is this: managers and supervisors must first be onboard with a change before they can support their employees. A change management team should create targeted and customized tactics for engaging and managing the change first with managers and supervisors, and only then charge this important group with leading change with their direct reports. Because of their relationship, managers and supervisors can coach individual employees through this change process and help them address the barrier points that are inhibiting successful change. Managers and supervisors liaise between their employees and the project team, providing information from the team to their direct reports. But perhaps more importantly, they provide information about the project from their employees back up to the project team. Managers are in the best position to provide design input, usability results and employee feedback on particular aspects of the solution back to the project team. They are also positioned to identify and raise valid functionality needs and concerns during the implementation phase of the project. No one is closer to a resistant employee than his or her supervisor. 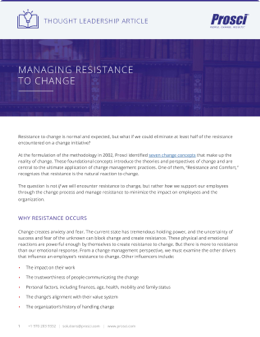 In terms of managing resistance, managers and supervisors are in the best place to identify what resistance looks like, where it is coming from and the source of that resistance. They are also the best suited (when provided with the training and tools to do so) to actively manage that resistance when it occurs. They can use the ADKAR Model to hone in on which element of the change process is driving resistance and address it accordingly. How Effective are Managers and Supervisors? Participants in the Best Practices in Change Management - 2018 Edition ranked their managers and supervisors in terms of how well they were fulfilling the five roles listed above. For each role, participants ranked managers and supervisors on a scale from "completely ineffective" to "extremely effective." 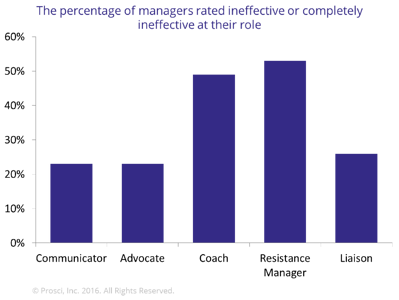 The graph below shows the percentage of participants ranking their managers and supervisors as "ineffective" or "completely ineffective." From the data, it is easy to see that managers are struggling the most with fulfilling the coach and the resistance manager roles. The roles of coach and resistance manager represent the biggest departure for many managers from the role they have historically played in the organization. Effectively coaching employees through a change and identifying and managing resistance to change require a new set of skills. Many times, great managers have difficulty when tasked with becoming great managers of change because they have not been adequately prepared to do so. 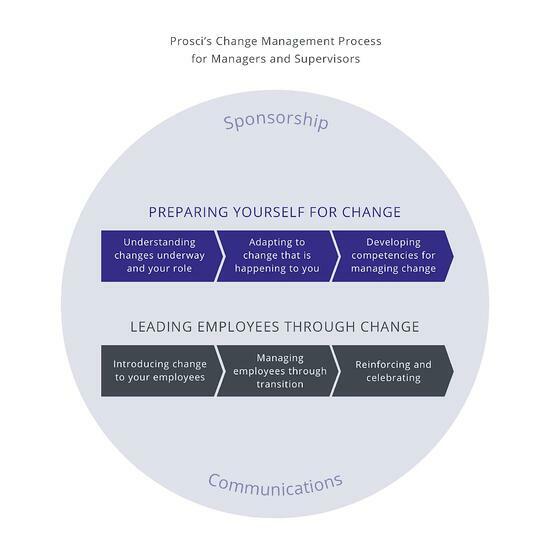 Participants in Prosci’s Best Practices report indicated whether or not they provided formal change management training to managers and supervisors. Only 37% of participants in the 2016 edition of Best Practices in Change Management trained this crucial group. This finding should set off a warning for many change managers and business leaders. 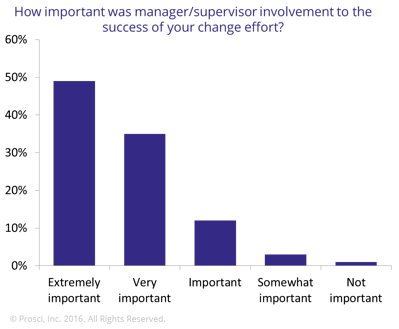 While managers and supervisors are identified as a critical success factor in times of change, they are not being adequately prepared to fulfill the roles identified in the research. Have we told managers and supervisors what we expect from them in times of change? Do they fully understand the specific actions and behaviors we need from them to support a change effort? Have we provided them with the skills and tools to be successful at leading their direct reports through change? If you answer "no," then you risk losing the support and benefit that comes from engaging this important cog in the change management system. Consider how you can build awareness of the need for managers to play their important role in times of change, and how you can engage them in learning skills and frameworks for helping themselves and their employees successfully through transitions. Resistance to change is normal and expected, but what if we could eliminate at least half of the resistance encountered on a change initiative? The research suggests you can. Read this article to learn how to successfully manage resistance on your projects and initiatives.